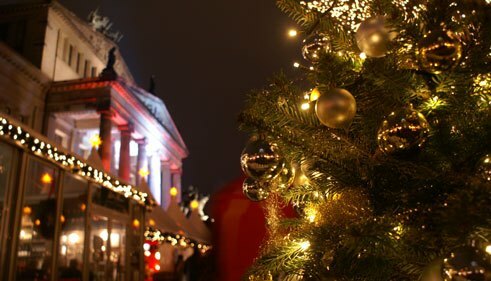 No other time of year is as heavily laden with traditions and rituals in Germany as Christmas. And not every region cultivates the same yuletide customs. Here’s a brief overview. The Advent season is counted down to Christmas on Advent calendars, which children adore. On the 1st of December they get to open the first little door, behind which they find a chocolate or some other little treat. On the 2nd of December they get to open the 2nd door, and so on and so forth up to 24 December. In German supermarkets you can usually buy an Advent calendar even as early as October. They now come in a wide range of different getups: lavish or on the austere side, big or small, filled with sweets or other little treats. But many families make their own calendars, e.g. out of 24 matchboxes, toilet paper rolls, socks or bags. Nikolaustag commemorates Saint Nicholas of Myra, a Greek bishop in what is now Turkey, who gave away all he owned. He is remembered on St. Nicholas’ day, the 6th of December. On the evening of the 5th, children all over Germany clean their boots and place them in front of the door. And in the morning they open the door to find them filled with sweets, nuts and fruit – by St. Nicholas, of course! Some people look forward to it all year, others curse the season in which the stalls clutter up the centre of town. Christmas markets mostly sell food and drink, but also Christmas presents. The scent of Glühwein (mulled wine) and roasted almonds hangs in the air. Some towns are famed for their Christmas markets, for example Dresden’s Striezelmarkt (named after a type of cake – now known as Stollen – traditionally sold there) and Nuremberg’s Christkindlesmarkt (“Christ Child Market”). It’s a must in every German home on Christmas Eve. How and when it is decorated is in many a family subject to strict house rules. Most wait till shortly before or the morning of 24 December to trim the tree. Deciding on the trimmings can sometimes prove a bone of contention: Real candles or electric fairy lights? Tinsel or not? Simple straw stars or loads of glossy ornaments and glitter? The tree is usually kept standing in living rooms till 6 January (Epiphany) and then disposed of. Many families have established their own special rituals for their annual Christmas Eve programme. The 24th of December is the one day of the year on which most Germans go to church, and the Christmas services and nativity plays commemorating the birth of Jesus are well attended in every German town. Presents are traditionally wrapped and placed under the Christmas tree, where they are then handed out and opened. The Weihnachtsmann (Father Christmas/Santa Claus) sometimes comes to small children and asks, “Have you been a good boy/girl?” The custom is for children to sing a song or recite a rhyme for Santa, a custom still observed in plenty of families, where children still sing, make music or read aloud even though they’ve long since become teenagers. Advent is a sweet season. In the course of December, it’s a tradition to bake Plätzchen, a sort of biscuit or cookie that’s only supposed to be made for Christmas. The standard varieties are Zimtsterne (cinnamon stars), Vanillekipferl (vanilla crescents), Butterplätzchen (butter cookies) and Spekulatius (spiced biscuits). Stollen, a mix of cake and sweet bread with raisins, almonds and dried fruits, is also popular, especially in Eastern Germany. Dresden is known for its Christstollen, while in Thuringia it’s called Schittchen. Other regions favour quark (a kind of fromage blanc)-based Stollen. Lebkuchen, a kind of gingerbread, is another favourite on the Advent platter. The most famous Lebkuchen is from Nuremberg, though Aachen is also known nationwide for its Printen. Germans generally relish big hearty meals over the Christmas holidays. It’s a widespread custom to eat potato salad and small sausages on Christmas Eve, because people used to (and some still do) work on the morning of 24 December, so that evening they wanted a meal that could be prepared quickly and easily. The meals cooked for the first and second days of Christmas, on the other hand, are all the more elaborate: roast goose or duck is served in many homes with red cabbage and Knödel (dumplings) on the side. And the foremost beverage at Christmastime in Germany is Glühwein, hot red wine spiced with cinnamon and cloves. Anne Fromm is a freelance journalist based in Berlin.